True Jones fracture is in the proximal meta-diaphyseal junction of the 5th metatarsal base in which the main fracture line extends into the 4th-5th metatarsal articulation. MOI: For true Jones Fracture believed to occur from a large adduction force applied to the forefoot with the ankle in plantarflexion. (Lawrence SJ, Foot Ankle 1993;14:358). 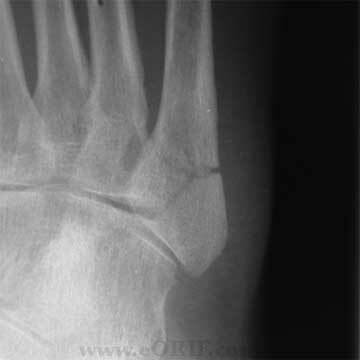 Tuberosity avulsion fractures result from the pull of the Peroneus brevis or the lateral band of the plantar aponeurosis. relative avascularity of this area, a nonweightbearing cast is the treatment of choice. Zogby RG, Baker BE: A review of nonoperative treatment of Jones fracture. Am J Sports Med 1987;15:304-307. Base of the 5th MT has 2 articulations: (1)cuboid-fifth metatarsal articulation, (2)fourth-fifth intermetatarsal articulation. Peroneus brevisinserts over a broad area on the dorsolateral aspect of the tuberosity. Peroneus tertiusinserts into the dorsal surface of 5th metatarsal base. Lateral band of the plantar aponeurosis inserts on the plantar surface of the styloid. 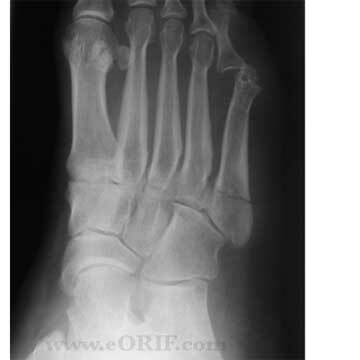 Os peroneum is a sesamoid bone in the Peroneus longus tendon near the proximal fifth metatarsal adjacent to the cuboid. Present in 15% of patients (Daeron TB Jr, JBJS 1975;57A:788). Os vesalianum is an ossicle in the Peroneus brevistendon.Present in 0.1% of patients (Daeron TB Jr, JBJS 1975;57A:788). . Secondary center of ossification appears between 9 and 11 years in girls and 11 and 14 in boys. Complete union with the shaft occus in less than 2 years. Patients with acute tuberosity avulsion fractures, or true Jones fractures complain of lateral foot pain and swelling after an injury. Patients with diaphyseal stress fractures will complain of preceding pain in the lateral aspect of the foot. A/P, lateral and obliqueviews of the affected foot. Acute fractures demonstrate sharp fracture lines without widening or radiolucency and minimal cortical hypertrophy. Nonunions demonstrate wide fracture lines with periosteal new bone formation and obliteration of the medullary canal with intrameduallar sclerosis. Zone 1; Nondisplaced Tuberosity Avulsion Fracture: common. Treatment = hard-soled shoe or walking cast until pain subsides. Generally heal in 8 weeks. Zone 1; Displaced Tuberosity Avulsion Fracture(intra-articular extension with >2mm step-off): uncommon. Treatment = ORIF with screw or Kirschner wire fixation. Zone 1; Symptomatic Tuberosity Avulsion Fracture Nonunion: Treatment = excision of small fragments which do not violate insertion of Peroneus brevis; ORIF for large fragments (Rettig AC, ALSM 1992;20:50). Zone 1; Asymptomatic Tuberosity Avulsion Fracture Nonunion: Treatment = activity as tolerated. 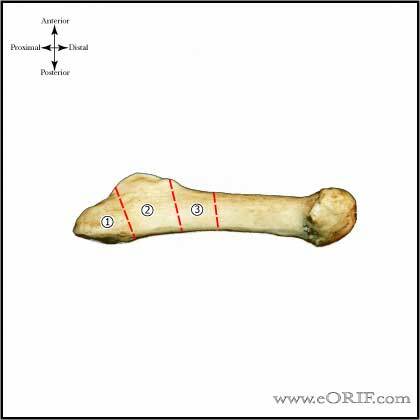 Zone 2; Acute Nondisplaced True Jones Fracture: Treatment = non-weight-bearing short leg cast for 6 to 8 weeks. Consider initial intrameduallary screw fixationfor high level athletes (Mindrebo N.AJSM, 1993;:720), or if there is intramedullary sclerosis and a lucent fracture line at the 8 week follow-up. Zone 2; Acute Displaced True Jones Fracture: Treatment = intrameduallary screw fixation. 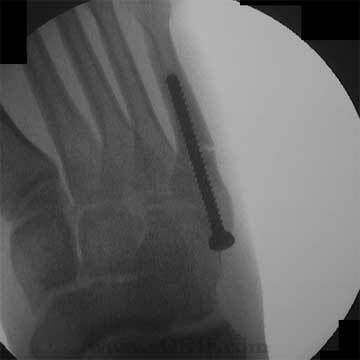 Zone 2; True Jones Fracture Nonunion: Treatment = intrameduallary screw fixation. Zone 3; Acute Nondisplaced Diaphyseal fracture: Treatment = non-weight-bearing short leg cast for 6 to 8 weeks. Consider initial intrameduallary screw fixationfor high level athletes, or if there is intramedullary sclerosis and a lucent fracture line at the 8 week follow-up. Zone 3; Acute Displaced Diaphyseal Fracture: Treatment = intrameduallary screw fixation. Zone 3; Diaphyseal Stress Fracture with neutral heel: Treatment = intrameduallary screw fixation. Zone 3; Diaphyseal Stress Fracture with flexible cavovarus heel: Treatment = intrameduallary screw fixation of the 5th metatarsal with dorsiflexion osteotomy of the 1st metatarsal (DenHartog BD, JAAOS 2009;17:458). 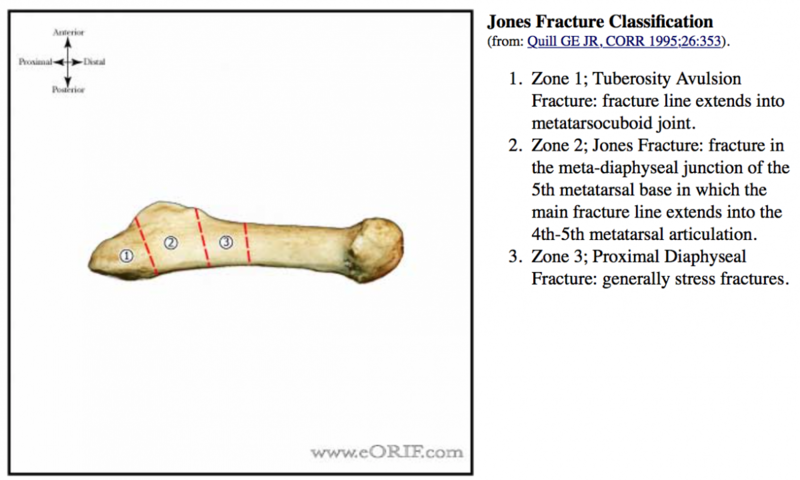 Non-operative treatment for acute true Jones fractures may take up to 21 weeks.